I love this polish, but it does *not* photograph well. It looks even pinker in the shop listing, so don’t know what to tell you. It’s definitely red in person, though I desire an even redder one from the site. It’s on my wishlist and everything… yes, you can make a wishlist on the site, and isn’t that just dangerous. 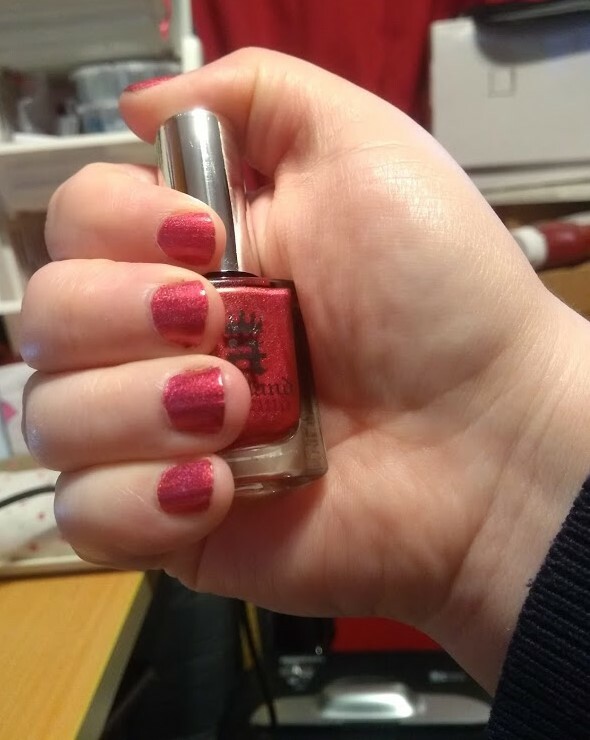 It amuses me to not end because red isn’t my favourite polish colour by a country mile, but these reds are just stunning. And the polish itself dries quickly and survives my abuse beyond anything else I’ve ever purchased, so they’ll definitely continue to get my custom. Work wasn’t as productive today as I would have liked; I kept zoning out and being distracted by shiny objects. But hey, it’s Friday, so who cares. *chuckles* I’m looking forward to doing nothing of importance, and I am going to get back to that now.